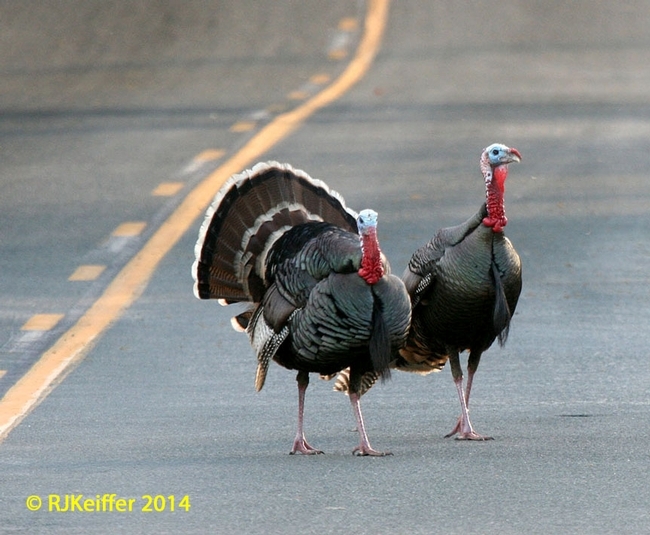 Beware - Turkeys on the road! This title might be found on the front page of any newspaper in California! But why do we commonly associate bad-behaving humans with turkeys? Please... give those wild turkeys some respect! Wild turkeys are native to North America, but the species has not been in the California region of the continent since the Pleistocene time period 10,000 to 12,000 years ago. Evidence of Meleagris californica, the now extinct California Turkey, shows up in preserved remains from the La Brea tar pits of Los Angeles County, CA. Ancient remains have also been found from the Potter Creek Cave, Shasta County CA. However, why the turkey disappeared from California thousands of years ago can only be speculated. The Wild Turkey (Meleagris gallopavo) was introduced (or reintroduced?) into California in a campaign of widespread releases by the California Department of Fish & Game (now renamed Ca. Dept. of Fish & Wildlife) during the 1960s and 1970s. The UC Hopland Research & Extension Center cooperated with the release program in 1972 by allowing CDFG to turn loose wild turkeys on the property. Wild Turkeys still persist and are common on the Center and throughout the North Coast. Despite the gamebirds providing a fantastic sport hunting opportunity throughout the North Coast, there is some debate as to the species' impacts on certain environments in California.